TCR–pMHC interaction is the keystone of the adaptive immune response. This process exhibits an impressive capacity of speed, sensitivity, and discrimination that allows detecting foreign pMHCs at very low concentration among much more abundant self-pMHC ligands. However, and despite over three decades of intensive research, the mechanisms by which this remarkable discrimination and sensitivity is attained remain controversial. In kinetic proofreading mechanisms (KPR), an increase of specificity occurs by reducing the sensitivity. To overcome this difficulty, more elaborate models including feedback processes or induced rebinding have been incorporated into the KPR scheme. Here a new approach based on the assumption that the proofreading chain behaves differently for foreign- and self-pMHC complexes has been integrated into a phenotypic model in which the complexes responsible for T cell activation stabilize (for foreign peptides) or weaken (for foreign peptides), resulting in a dramatic increase in sensitivity and specificity. Stabilization and destabilization of complexes may be caused by conformational changes, rebinding, or any other process leading to variations in the dissociation rate constants of the complexes transmitting the activation. The numerical solution and the analytical expression for the steady-state response as a function of koff(i) (i = 0, 1, …, N, where C0, C1, …, CN are the complexes in the proofreading chain) are provided. The activation chain speeds up, and larger increases in sensitivity and discrimination are obtained if the rate of activation along the proofreading chain increases for foreign pMHCs and decreases for self-ligands. Experimental implications and comparison with current models are discussed. TCR–pMHC interaction leading to T cell activation is the keystone of the adaptive immune responses to infections and cancer and plays a decisive role in allergy, autoimmunity, and transplant rejection (1). The clonotypic receptor of T lymphocytes (T cell receptor, TCR) recognizes antigenic peptides accommodated in the groove of major histocompatibility complex (MHC) molecules expressed on the membrane of antigen-presenting cells (APC) or target cells (2). The engagement of TCR with its specific antigenic peptide (agonist)/MHC complex (pMHC) triggers intracellular signaling pathways that induce the expression of genes required for T cell-mediated effector functions, such as T cell proliferation, cytokine secretion, and cytotoxicity (3). While the repertoire of human T cells can recognize the enormous variety of antigenic peptides present in nature (4), only a small proportion of mature T cells can recognize a specific pMHC complex (5). T cells achievement of that property is accomplished by mean of a very high sensitive and specific pMHC recognition process whereby T cells are capable to respond quickly to very low levels of foreign pMHC but ignore huge amounts of self-pMHC. This process is called antigen discrimination, and it has been reported that even recognition of a single agonist pMHC can produce intracellular increases of Ca+2 (6) and cytolytic activity (7). In turn, selectivity is characterized by the ability of a particular TCR to discriminate between peptides differing in a single amino acid presented in a particular MHC allele. However intriguingly, mature peripheral T cells tolerate cells presenting only self-pMHC but are elicited by interaction with the same cells expressing even scarce quantities of foreign peptides. The successful outcome of these processes is critical because if discrimination fails, it leads to either infections or autoimmune diseases (8). In other words, the cell fate of the immune system relies on the capacity of T-cell signal transduction to satisfy the following three properties for appropriate initiation of the immune response: speed, sensitivity, and specificity (9). The underlying mechanisms for these unique features of T cells function remain enigmatic, and different hypothesis, verbal, and theoretical models have been proposed along the past decades to explain T cell activation [reviewed by Zarnitsyna and Zhu (10) and Lever et al. (11)]. However, currently, and despite extensive experimental and theoretical work, there is no model relating the TCR–pMHC binding interaction to T cell activation that is consistent with the published experimental data (11). 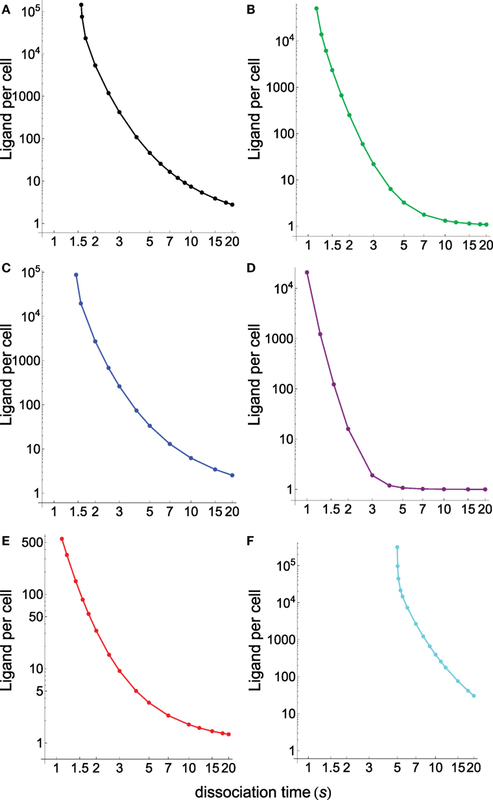 By focusing on the three properties of T cell activation above mentioned, the simplest approach is the TCR occupancy model that is based on the requirement of a threshold for the number of TCR–pMHC bonds (12). This is supported by experimental observations of an increased stimulation level produced by increases of pMHC concentration and a density compensation for weaker ligands (13, 14). However, this model does not explain discrimination because high occupancy can be also attained for low-affinity pMHC by increasing its concentration. 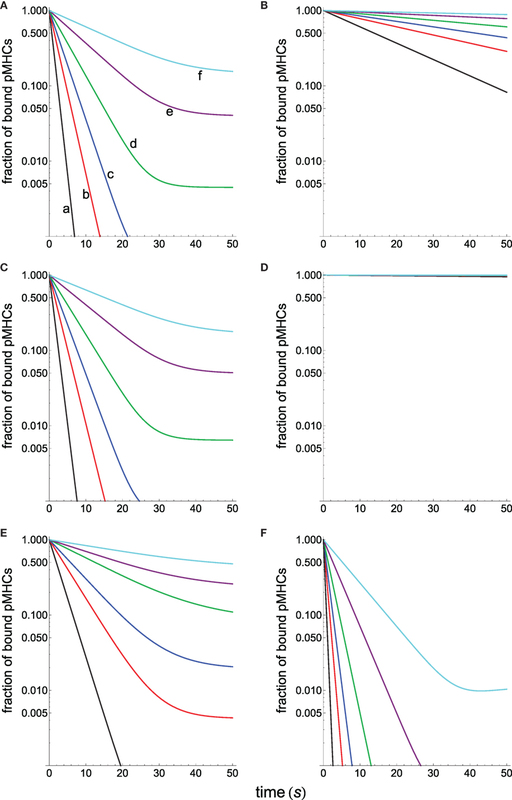 In addition, occupancy models have also been precluded by experiments showing that increases of low-affinity pMHC concentration do not activate T cells (15), while very low concentrations of a pMHC whose affinity is only threefold higher can actually do it (16). Recent experimental and theoretical works (15, 17–20) suggest that the major influence in the discrimination process is exerted by the dissociation time of the TCR–pMHC complex. Thus, it has been pointed out (9, 21) that an ideal response in terms of specificity and sensitivity should imply the existence of a threshold time for a TCR–pMHC interaction (below which there is no T cell activation) and a number of ligand per cell as low as possible [ideally one single ligand, see Figure 1A in Ref. (9, 21)]. Interestingly, the kinetic proofreading (KPR) mechanism proposed by McKeithan (22) amplifies differences in affinities and dissociation times of pMHC ligands, which would permit discrimination among them. In this mechanism, pMHC ligands bind to TCRs to form a TCR–pMHC complex (C0) that goes through a sequence of N biochemical modifications (complexes C1, …, CN), which form the proofreading chain. Since in this chain only CN is the productive signaling complex, it introduces a delay in the activation transmission that must fulfill with the minimum threshold time required for successful signaling. However, it has been shown (9, 21) that although KPR can largely increase discrimination is at the expense of a large reduction in sensitivity. To overcome this difficulty, more elaborate models that include feedback processes or induced rebinding have been incorporated into the basic KPR scheme (9, 17, 21–26), although it has been suggested that the existence of a trade-off between sensitivity and specificity appears to be a general principle (24). Based on these observations, we consider that differences between the dissociation times of the TCR–pMHC complexes formed among foreign and self-ligands are insufficient to explain the big discrepancies exhibited by T-cell activation induced by both kinds of ligands. Hence, we hypothesize that the proofreading chain leading to a productive response behaves quite differently for foreign and self-peptides, which causes that the resulting activation chains for both types of ligands have also different properties. This, in turn, would be the main factor responsible for their specific and distinct responses. Starting from this assumption we have developed a model where the complexes engaged in KPR stabilize (for foreign peptides) or weaken (for self-pMCH ligands), as the activation chain progresses, resulting in an enhanced response with a dramatic increase in sensitivity and specificity. In addition, further improvements in sensitivity and discrimination are obtained if the rate for activation propagation among the Ci complexes increases for foreign ligands and decreases for self-complexes as activation progresses. The combination of these two effects reinforces and speeds up the transmission proofreading chain in the case of foreign peptides and delays and weakens (or even breaks down) the chain with self-ligands, which allows to explain why huge amounts of self-pMHCs are not able to activate T cells while, conversely, even a single foreign pMHC can trigger the T cell response. Number of TCRs TT = 2 × 104; kon = 5 × 10−5 s−1; kp = 1 s−1. There are no concentrations units: all concentrations in figures, in tables, and in rate constants are per cell. Thus, kon = 5 × 10−5(molecule × s)−1; koff = 1/τ and kp represent in our model koff(0) and kp(0), respectively. These parameter values are similar to those used in Ref. (9, 11, 16). In addition to the above parameters, in the induced rebinding model [Dushek and van der Merwe (21)], the signaling decay rate (λ = 104 s−1) and the rate of rebinding of the Ci complexes ρi are also required: ρi = 103 s−1 for i ≤ 21 increasing to 107 s−1 for i = 25 [see Figure S2 in Ref. (21)]. Our model (see Figure 1) is described by a system of ordinary differential equations (ODEs), which is given in Appendix. Numerical solution of the system of ODEs and all remaining calculations and plots were performed using Mathematica 9.0. Figure 1. Scheme of our modified KPR model: P (free pMHCs) and T (free TCRs) bind to form the complex pMHC–TCR (C0) with rate constants kon and koff. C0 initiates the proofreading chain that propagates activation through the complexes C1, C2, …, CN, where CN is the productive signaling complex at the end of the chain. 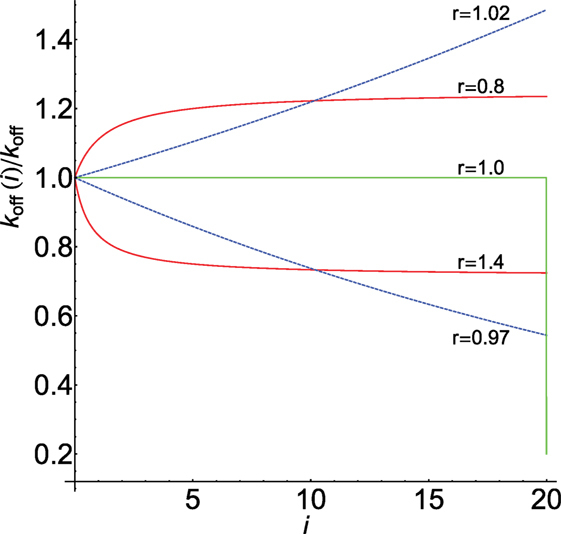 The dissociation rate constants koff(i) (i = 0, 1, …, N) and the propagation rate constants kp(i) (i = 0, 1, …, N − 1) of the Ci complexes change in a different way for foreign and self-ligands along the activation chain. • As in the classic KPR scheme, unbinding of pMHCs from Ci complexes reverts the TCR to its initial unmodified state. • Current models based on the KPR mechanism assume that the unbinding rate constant (koff = 1/τ) is the same for all the Ci complexes and is equal to that of the first TCR–pMHC complex (C0) in the proofreading chain. However, this assumption is not justified because for i > 0 these complexes go through a series of biochemical modifications whose actual values of koff are unknown. • The goal of T cell activation through TCR is to elicit efficient immune responses against cells presenting foreign peptides and ignore self-ligands. Hence, we assume that these different objectives should appear quantitatively reflected in the proofreading chain. One way to accomplish this goal is by considering that the values of koff are not constant, but they vary as activation progresses so that the chain propagation is reinforced when an efficient immune response takes place (foreign peptide) and weakened or broken down with self-ligands. • In our model, and for all kinds of peptides, koff (0) (denoted as koff for simplicity) is equal to 1/τ where τ is the dissociation time for the C0 complex. However, for i > 0, the values of koff(i) are unknown, although stabilization of the Ci complexes would occur if koff(i) decreases along the chain propagation, while they are less stable if koff(i) increases as i → N. As we show below, this causes a dramatic enhancement in the capacity of discrimination and sensitivity between foreign and self-peptides regardless of whether there is little or no difference between their dissociation times. • In the KPR and related models, the rate of propagation of the activation (kp) among the Ci complexes is considered to have the same value along the proofreading chain. In our model, this assumption has been removed so that the values of kp(i) for foreign ligands increase to facilitate and speed up the productive signal as i → N, while for self-ligands those values decrease, which delays and weakens (or even breaks down) the activation chain. Quantitatively, the TCR–pMHC engagement time will be a function on N and the propagation rate constants for the Ci complexes along the proofreading chain. • Given that the experimental values of koff(i) and kp(i) are currently unknown, computational responses were obtained using several types of reasonable functions discussed in next sections to fulfill our assumptions for foreign and self-ligands. • The reaction rate constants and other parameter values used for computation were similar to those used by François et al. (9), Altan-Bonnet and Germain (16), and Lever et al. (11) and are given in Materials and Methods. • Responses from our model were computed by solving deterministic ordinary differential equations (ODEs), i.e., stochastic effects were not taken into account. Recent studies (9, 21) have shown a good agreement between deterministic and stochastic responses for this type of models. and being TT and PT the total number of receptors and pMHC ligands. Summarizing, the response can be obtained as a function of t by solving numerically the system of ODEs shown in Appendix or analytically under steady-state conditions [equations (1)–(5)], by introducing into them the values of the dissociation and propagation rate constants [koff(i) and kp(i)] for the different types of pMHC ligands engaged in the activation process. If t is sufficiently large, the numerical solution response approaches the analytical solution. (a) The simplest situation occurs in the basic KPR when all dissociation and propagation rate constants are the same along the proofreading chain, i.e., koff(i) = koff (with koff = 1/τ) and kp(i) = kp for all Ci complexes. By inserting these conditions into equations (1)–(5), they are greatly simplified, and after a little algebra we find: α = kp/(kp + koff), C0 = koffCT/(koff + kp), Ci = αiC0(1 ≤ i < N), CN = αNCT, and where ε in equation (5) is now koff/kon = KD, the dissociation constant of the TCR–pMHC complex. These are the well known expressions for the classic KPR mechanism (11, 22), and it provides a test for the correctness of our expressions. As expected, if c = 1, equation (7) simplifies to those of the basic KPR. The main difference with equation (8) is their behavior when N > > 1. Under these conditions, equation (9) shows that koff(N) → 0 for antigenic peptides (r < 1), while increases without bound for self-ligands (r > 1). In other words, for r ≶1 and long proofreading chains, stronger and weaker productive responses will be observed than with equation (8). Figure 2 displays the behavior of koff(i)/koff computed from equations (8) and (9) for N = 20 and different values of r. As we show below, this parameter strongly modulates the response through the koff(i)-values for foreign and self-ligands. For comparison, graph of equation (6) and its digital behavior is also displayed (in this case koff(i)/koff drops abruptly from 1 to c at the end of the chain, i.e., for i = N). where kp = kp(0) denotes the rate constant for the transformation C0 → C1. As previously, if r = 1 we have kp(i) = kp for all Ci complexes as in the basic KPR. Figure 2. Dependence of koff(i)/koff on i for N = 20: red [equation (8)], blue [equation (9)]. Values of r shown on the curves. Graph of equation (6) with c = 0.2 is in green. The horizontal part of the green plot where koff(i) = koff is also the graph of equations (8) and (9) when r = 1. In the KPR models proposed so far, specificity and sensitivity between self- and foreign pMHCs are achieved mostly through differences between their dissociation times. In fact, if two pMHCs have the same dissociation time they should provide the same response so that it is not possible to discriminate between these ligands (by assuming that the rest of parameters kon, kp, and N are also the same). However, in our model, this is not the case since the activation chain can modulate strongly the response in a different way for antigens and self-ligands regardless of their dissociation times. To illustrate this fact, and although antigenic peptides have larger dissociation times than self-ligands, we have considered a situation where two ligands, one supposed to be an antigenic and the other a self-ligand, have the same value of τ. If predictions from our model demonstrate that discrimination under these unfavorable conditions would occur, then under more favorable conditions, i.e., when dissociation times for foreign ligands are larger than for self-pMHCs, specificity will be also greatly enhanced. Since we hypothesized that the activation chain behaves differently for antigens and self-ligands, equations (8) and (10) with appropriate values of r for both types of ligands were used to compute the corresponding dissociation and propagation rate constants. The corresponding responses obtained under these conditions are displayed in Figure 3 (computation details are given in Appendix) where Figure 3A shows that, despite both pMHCs having the same dissociation times, the fractions of productive pMHCs remaining bound to the TCR (i.e., CN/PT) over time are quite different for the antigenic peptide and for the self-ligand that allows to discriminate between them (curves a and b). Thus, for a threshold time of 5 s that fraction is 34-fold larger for the foreign ligand (curve a) than for the self-ligand (curve b), and this value is 1195-fold higher if the threshold is 10 s. In turn, sensitivity is also enhanced, and we find (see Appendix for computation details) that while the foreign antigen requires just a few ligands (<5) to get a productive response, the self-pMHC needs a huge amount of them (>109). Figure 3. (A) Dependence of the fraction of productive pMHCs that remains bound to TCR on time for two kinds of ligands displaying the same τ = 2 s, but the first presents a foreign peptide (red curves), while the second contains a self-peptide (blue curves). Computations were performed for N = 10 as described in Appendix. koff(i) and kp(i) in the different curves were obtained, respectively, from equations (8) and (10) with the following values of r: (a) 2.5, 0.5; (b) 0.5, 2.5; (c) 2.5, 1; (d) 0.5, 1. In curves (c) and (d), the values of kp(i) = kp are constant. (B) Progress curves of the response CN as a function of t for the cases shown in (A). For curve b, practically no response is obtained, and its plot is almost coincident with the x-axis. Further insights into this subject are obtained from the behavior of the curves c and d in Figure 3A, which were obtained proceeding as previously, but with the condition that kp(i) = kp remains constant along the proofreading chain for both ligands. This eliminates one of the factors that modulate the activation progression so that specificity and sensitivity will be only due to the influence exerted by the different behavior of the dissociation rate constants for foreign and self-ligands. Note that under these conditions, the kp(i)-values in curve c are smaller than in curve a, while in curve d these values are larger than in curve b. Hence, this slows down the progression of the activation for the foreign pMHC and speeds up it for the self-ligand and, as a result, curves c and d are closer than curves a and b, and the ratio of the fraction of bound pMHCs at 10 s is 566 instead 1195. 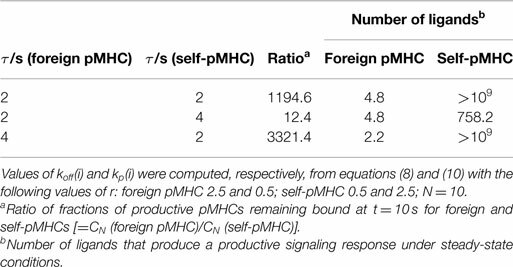 Also, the required number of ligands to elicit a productive response is 9.3 for the foreign pMHC and 820 for the self-pMHC instead of 5 and >109 ligands previously found when kp(i) was not constant. This shows that, although foreign and self-ligands in this example have the same propagation rate constants, specificity and sensitivity still remain high because of the opposing influences exerted by the dissociation rate constants of both ligands on the proofreading progression. Finally, Figure 3B shows the progression of the productive response CN as a function of time for the cases displayed in Figure 3A. As expected, and in agreement with results obtained in Figure 3A, curve a for the foreign pMHC exhibits the earliest and largest response while, conversely, no appreciable signaling response for the self-pMHC can be detected in curve b. Similar considerations apply to the other curves. Also, note that in all curves steady state is reached within tens of seconds. The above results show that specificity and sensitivity for recognition of foreign and self-ligands result from the modulation power exerted by the activation chain through the values of koff(i) and kp(i) in conjunction with differences between the dissociation times of the ligands. In fact, the modulation power of the activation chain could be as effective that responses overriding differences between dissociation times could occur. This is shown in Table 1 where three different cases have been considered: the self-pMHC has equal, larger, and smaller (this is the normal situation) dissociation time than the foreign pMHC. The ratio of fractions of productive pMHCs remaining bound, and the number of pMHCs required to get a productive response for the three cases have been determined, and included in the table. 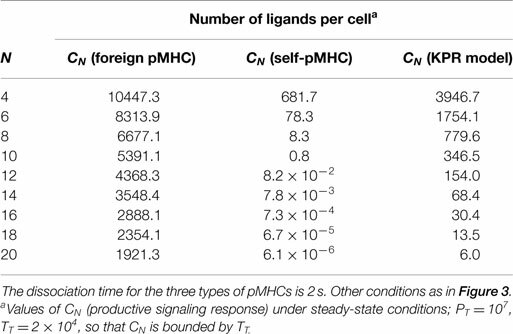 This demonstrates that even when the dissociation time of the self-pMHC is twice than of the foreign ligand (second row of the table), the value of CN (foreign pMHC)/CN (self-pMHC) is still 12.4, while the number of ligands to get a productive response are 4.8 and 758.2 for the foreign and self-pMHCs, respectively. Table 1. Dependence of specificity and sensitivity on the dissociation times of the foreign and self-pMHCs. The length of the proofreading chain is given by the N-value, which also contributes greatly to reinforce the activation progression for foreign pMHCs and to its weakening in the case of self-ligands. This is displayed in Table 2 where productive signaling responses for a foreign and self-pMHC with the same dissociation time (2 s) have been determined as a function of N. The corresponding response obtained using the standard KPR model for a pMHC ligand with τ = 2 s has also been included for comparison. The values of CN were determined in the presence of a large amount of pMHC ligands (107) to show the different transmission power of the proofreading chain under conditions of pMHC saturation. If we consider that a productive response is attained for CN ≥ 1 (21), it follows that in the case of self-pMHCs our model predicts the rapid weakening of the activation transmission chain as N increases and the break down of the chain progression for N ≥ 10. Conversely, the KPR model predicts that a positive response for the self-pMHC will be observed even for N = 20. In other words, the different properties of the activation chain against foreign and self-pMHCs cause that the required chain length to achieve discrimination between both types of ligands is much shorter in our model than in the standard KPR scheme, which, in turn, attains the important goal of speeding up the immune response (see Appendix for quantitative details on the speed of the activation chain). This fact, together with results previously displayed in Figure 3 and Table 1, explain why just a few foreign pMHCs are able to trigger a rapid T cell response while huge amount of self-pMHCs are unable to activate the TCRs. Table 2. Dependence of the productive signaling response CN on N.
Finally, it has been found that some ligands with short lifetimes can also trigger responses, which have been explained by assuming that these ligands reassociate quickly after unbinding so that their effective binding time is much longer (9). To test if this situation can be also predicted by our model, we have computed CN for agonists with a short lifetime (τ = 0.5 s), and we have found that a response can be triggered with a relatively low number of ligands (PT = 1000) for chain lengths of up to N = 12 (the rest of conditions as in Figure 3). Even if τ is as low as 0.1 s, a productive response is still obtained up to N = 6, although now a higher number of agonists is required (105). In this section, we compare predictions of our model for specificity and sensitivity with the corresponding predictions computed from the standard KPR model, the KPR modified by McKeithan (22) [in this model, the complexes C0, C1, …, CN−1 have the same koff = 1/τ except the final productive CN complex, which has a much smaller rate dissociation constant, see equations (6) and (7)] and the induced rebinding model recently proposed by Dushek and van der Merwe (21) (in this model the standard KPR scheme is modified to allow for pMHC rebinding). Computation details are given in Appendix. • As expected, the standard KPR model exhibits a high discrimination capacity (Figure 4A) although the corresponding sensitivity is low (Figure 5A). • Specificity calculated from the KPR with McKeithan’s modification is largely decreased, while the related sensitivity is enhanced (Figures 4B and 5B). • Specificity and sensitivity calculated by applying the induced rebinding model with N = 20 display large discrimination capacity and low sensitivity (Figures 4C and 5C). • However, for N = 25, specificity and sensitivity plots for the induced rebinding model are quite different. Thus, specificity is almost lost (Figure 4D), while sensitivity is greatly enhanced (Figure 5D). • That the behavior of the induced rebinding model is quite different for N = 20 and N = 25 occurred because the rebinding rate constants (ρi) are unknown, and it was assumed that for N ≤ 20 the ρi-values are almost constant (ρi≃103 s−1) while for N = 25 the ρ-value changes abruptly to 107 s−1 (21). For these values of ρi, induced rebinding has little effect on specificity/sensitivity when N = 20 so that their corresponding plots are very similar to those obtained with the standard KPR model [compare (A) and (C) in Figures 4 and 5]. Conversely, for N = 25, the rebinding rate for the productive response is so high (107 s−1) that ligands remain trapped for longer period of times within the TCR clusters, which cause a great loss of specificity (Figure 4D) and a large increase in sensitivity (Figure 5D). • In all the above models, there is a trade-off between specificity and sensitivity [(A–D) in Figures 4 and 5]. • Predictions from our model for specificity/sensitivity for a foreign pMHC are shown in Figures 4E and 5E. These plots display a large discrimination capacity as well as a great sensitivity because only a few ligands are necessary to elicit a response even for low values of τ. • Predictions from our model for specificity/sensitivity for a self-pMHC are displayed in (F) Figures 4 and 5. Besides the high specificity (Figure 4), it is worth to note the extremely low sensitivity for these kinds of peptides (Figure 5). Thus, for τ ≲5 s the proofreading chain is not established at all, i.e., no productive response is observed, even in the presence of huge amounts of ligands. Furthermore, in the case that self-ligands with larger dissociation times would exist, for example, τ = 6 s it follows from Figure 5 that more than 7 × 103 ligands would be required. • The last two remarks reveal that, in our model, discrimination between foreign and self-pMHCs comes mainly from the different properties of the activation chain for both kinds of peptides. In turn, this is also the reason why such big differences between their respective sensitivities arise regardless of their dissociation times. In other words, if we hypothesized that specificity/sensitivity depend on the transmission chain, then discrimination between foreign and self-pMHCs and their different sensitivities appear as a logical consequence of the fact that the proofreading chain leading to productive response delays and weakens (or even breaks down) for self-pMHCs while reinforces and speeds up for foreign pMHCs as activation progresses. In this case, the trade-off between specificity/sensitivity there would no longer be applicable, what really seems to occur in the adaptive immune response. Figure 4. Dependence of the fraction of productive pMHCs that remains bound to TCR on time for ligands with different dissociation times (s). N = 20 in all panels except in (D) where N = 25. (A) Basic KPR model: (a) black, τ = 1; (b) red, τ = 2; (c) blue, τ = 3; (d) green, τ = 5; (e) purple, τ = 10; and (f) cyan, τ = 20. Dissociation times in others panels as in (A). (B) KPR (McKeithan’s modification). (C) Induced rebinding model with N = 20. (D) Induced rebinding model with N = 25. (E) Our model: antigenic pMHC with koff(i) and kp(i) computed, respectively, from equations (9) and (11) with the following values of r: 0.95 and 1.05. (F) Our model: self-pMHC with koff(i) and kp(i) computed as in (E) with the following values of r: 1.05 and 0.95. Figure 5. Number of ligands required to obtain a productive response CN = 1 calculated under steady-state conditions as a function of their dissociation times for the different models shown in Figure 4. (A) Black, basic KPR model; (B) green, KPR (McKeithan’s modification); (C) blue, induced rebinding with N = 20; (D) purple, induced rebinding with N = 25; (E) red, our model: antigenic pMHC; (F) cyan, our model: self-pMHC. Other conditions as in Figure 4. Our assumptions on TCR/pMHC interaction have been modeled by considering that the dissociation and propagation rate constants vary in a different way for foreign and self-ligands along the activation chain. However, as actual values of koff(i) and kp(i) for the Ci complexes are unknown, new challenging experiments to determine these values are necessary to validate or refute our model (which also applies to the supposition that koff and kp do not vary along the proofreading chain on which current models are based). However, measurements of TCR–pMHC binding properties are difficult and, at present, only have been performed for the first complex (C0) of the proofreading chain (28, 29), although some studies revealed contradictory results (30). Hence, going further ahead in the kinetic proofreading chain is crucial to advance in downstream signaling knowledge although this is experimentally and technically challenging. In this regard, it is a hopeful sign that, even if the Ci complexes in the activation chain would have very similar structures, v.g., conformers with small differences of energy among them, the recently published kinetic analysis of protein conformational changes have shown that conformational states can exhibit different rate constants and affinities (27). We show a phenotypic model in which the progression of the proofreading chain occurs quite differently for foreign and self-pMHCs. Our model reveals that the three properties necessary to trigger the TCR/pMHC immune response, namely, speed, specificity, and sensitivity act coordinately so that no signal response will be observed for self-pMHCs, while a large effective response will be obtained with foreign pMHCs. We hypothesize that the different behavior of the activation propagation chain for both types of ligands results from stabilization (foreign pMHCs) and destabilization (self-pMHCs) of the complexes that participate in the proofreading chain. This assumption has been modeled by considering that the dissociation and propagation rate constants vary in a different way for both types of ligands along the activation chain. Deliberately, the model has been formulated as simple as possible to allow that modifications to accomplish for additional features of the immune response can be incorporated. Thus, for example, it has been reported (31) that self-peptides can also been recognized by TCR inducing tonic signals, which could be the result of weaker TCR-induced responses than those elicited by foreign peptides, i.e., that different T cell outcomes are achieved at different TCR signaling thresholds (32). In this regard, we have shown that our model allows modulating the strength and the outcome of the signal response through the parameter r involved in the dissociation and propagation rate constants. Nevertheless, like other phenotypic models, no explicit assumptions regarding the mechanisms involved in the stabilization/destabilization of the Ci complexes in the kinetic proofreading chain for foreign and self-ligands have been made, and we expect that future work will elucidate the nature of these processes and their contribution to the immune response. JG and PG-P designed research, performed research, involved in the formulation of the model, analyzed data, and wrote the paper; JJG involved in the formulation of the model and analyzed data. 2. Murphy K, Weaver C, editors. Janeway’s, Immunobiology. 9th ed. New York: Garland Science (2016). where P and T are the concentrations of free pMHC and TCR, respectively. 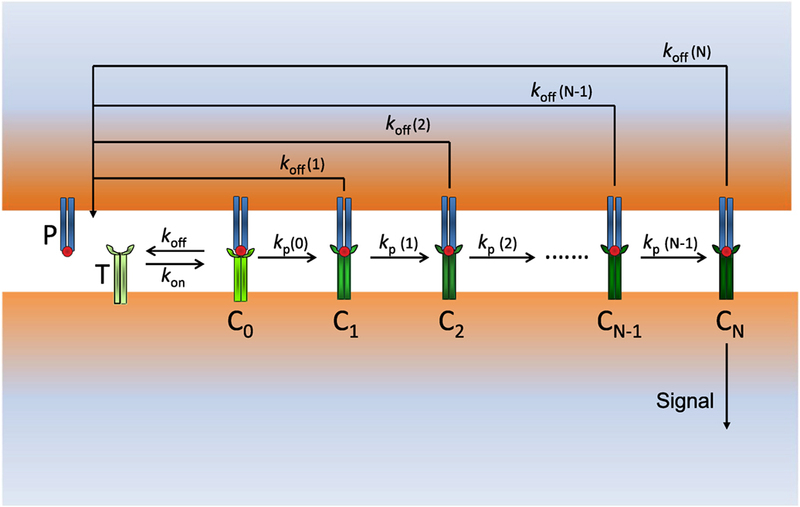 The parameters that govern the activation chain are N, the number of steps leading to the productive signaling complex CN; the binding rate, kon; and the dissociation and propagation rates, koff(i) and kp(i). The complexes involved in the activation chain are Ci (i = 0, 1, …, N) where C0 is the complex formed by the reversible binding of P and T, which through a series of chemical modifications leads to CN. In this regard, we must take into account that for the first step of the binding process (leading to the C0 complex which is the only one whose kinetic parameters have been experimentally measured) differences in affinity and kinetics between TCRs and self and foreign peptides are not large. 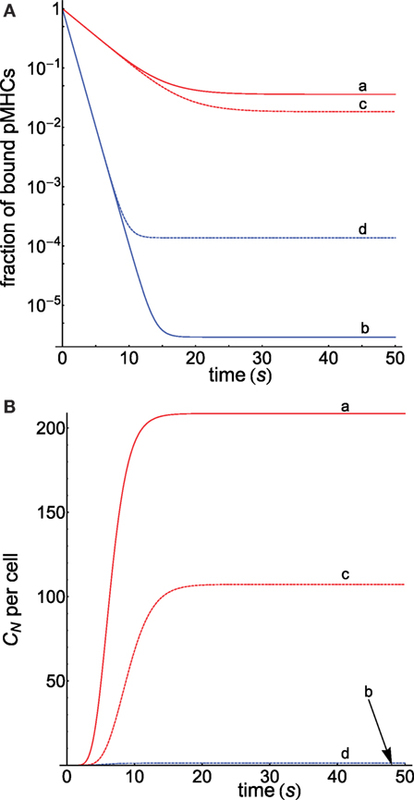 This is the reason why the occupancy model (that only considers the C0 complex) failed to explain the big differences in specificity, sensitivity and speed exhibited by T-cell recognition of self and foreign peptides. This is also the reason why the KPR model assumes that the signaling complex is not C0 but a CN complex at the end of the activation chain. However, and although KPR is able to amplify differences in affinity permitting discrimination, KPR by itself is insufficient to explain such big differences. where PT and TT are the total amount of pMCH and TCR. The steady-state solution is derived by inserting into the system of ODEs the conditions dP/dt = 0 (or dT/dt = 0) and dCi/dt = 0 and by using equation (A8). Thus, equations (1)–(5) in main text are obtained. – Panel A: dependence of the fraction of bound pMHCs (CN/PT) on time was computed by solving numerically the system of ODEs equations (A1)–(A5) with the initial conditions [equation (A6)]. Parameters as defined previously with PT = 1000. Other conditions as given in the caption. – Panel B: progress curves of CN computed by solving the system of ODEs with the initial conditions [equation (A7)]. Parameters as defined previously with PT = 1000. Other conditions as given in the caption. Computations were performed as described previously for Figure 3A. Since both the basic KPR and the KPR modified by McKeithan (22) are particular cases of our general solution, curves for these models (Figures 4A,B) were obtained by solving our system of ODEs with the functions koff(i) and kp(i) corresponding to these models [v.g., in the basic KPR koff(i) = koff, kp(i) = kp ∀i]. For the induced rebinding model (Figures 4C,D) curves were obtained by solving numerically the system of ODEs given by Dushek and van der Merwe (21). Finally, plots for a foreign and a self-pMHC (Figures 4D,F) were obtained by solving our system of ODEs under the conditions given in the caption. The number of pMHC ligands required to obtain a productive response can be determined by solving the system of ODEs with the condition that at t = t0 and for a given value of PT we have CN = 1. If t0 is sufficiently large, this value of PT coincides with that obtained under steady-state conditions, i.e., by solving the equation δCT = 1 [see equation (1) in main text]. In the induced rebinding model, the above condition is CN+CN∗=1 (21). where N1 and N2 are the number of steps necessary to reach a given level of productive response in the KPR and in our model, respectively. Thus, if we consider that N1 = N2 = 20, we have f1 = 1.736 for r = 0.5, i.e., the activation chain speeds up 73.6%, while f2 = 1.566 for r = 1.05. However, because N2 < N1 (see Table 2 in main text) these factors will be larger and so, if N1 = 20 and N2 = 10, we find f1 = 3.226 and f2 = 2.527. Copyright: © 2016 Gálvez, Gálvez and García-Peñarrubia. This is an open-access article distributed under the terms of the Creative Commons Attribution License (CC BY). The use, distribution or reproduction in other forums is permitted, provided the original author(s) or licensor are credited and that the original publication in this journal is cited, in accordance with accepted academic practice. No use, distribution or reproduction is permitted which does not comply with these terms.